The Swedish opera singer Jenny Lind (1820-87) was already well-known in Europe but became famous in Britain after her performances in London in May 1847, about six months before the Bronte sisters' first novels were published. In August 1847 the singer began a tour of the United Kingdom using our early railways; this page lists some of the places visited in Lancashire and Yorkshire in 1847 and 1848, along with some notes on the Bronte sisters. About a year after Jane Eyre was published the 'Swedish Nightingale' actually passed through 'Bronte Country', before it was so-named and before the Bronte sisters' identity was known to the public. Although the two never met, Charlotte Bronte was one of Jenny Lind's many admirers. iv) "I do like and esteem Jenny’s character"
Jenny Lind as Maria in La figlia di Reggimento c1847. 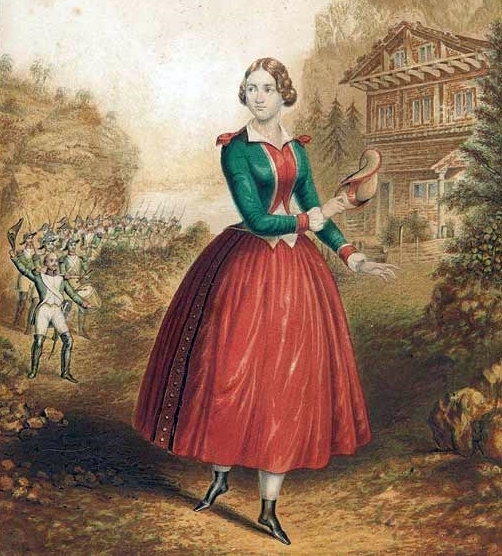 Source: Wikimedia Commons 'Jenny Lind Fille du Regiment'. For those who lived through the late 1840s they were peculiar times indeed. The arrival on these shores of Jenny Lind In April 1847 was met with great excitement and a wave of 'Lindmania' spread throughout the country. It has been compared with the Beatlemania of the 1960s and a large portion of the population became caught up in it. Even Victoria, Queen of England, was a fan of Jenny Lind, who was often referred to as 'The Queen of Song'. In 1847-9, Jenny Lind's name was given to a greyhound, a racehorse, a yacht, a schooner, railway engines, hospital wards and many commercial products. In Scotland a 'Jenny Lind' was still a hat, but at the same time it was the name of a flat, round, loaf of bread (possibly resembling a squashed hat) and in Aberdeen it was the name of a granite polishing machine. "The Jenny Lind mania has not yet subsided: rows for places at the Italian opera are of frequent occurrence. On Saturday last, the Hon. [George] De Grey, brother of Lord Walsingham, complained at Marlborough street against a gentleman named Frith, who had violently assaulted him on the previous evening. Each had paid £2.12s. 6d. for a stall in the pit, and each claimed the particular seat: the result was that Mr. Frith ejected Mr. De Grey, and the police-magistrate sentenced him to pay a fine of £5 for what he had done." (Stamford Mercury - Friday 02 July 1847). Even though the singer had no connection with them, Jenny Lind's name was used by British manufacturers to sell their products, and they went into overdrive: In fashions alone, apart from 'Jenny Lind' hats, there were 'Jenny Lind' patelots, 'Jenny Lind' cloaks, 'Jenny Lind' riding boas, 'Jenny Lind' dresses', Jenny Lind' mantles, 'Jenny Lind' capes, 'Jenny Lind' fans, 'Jenny Lind' caps & 'Jenny Lind' combs. In 1847 the wide-awake hat used by Jenny Lind in Donizetti's opera 'La figlia di Reggimento' was reproduced and sold as a 'Jenny Lind' hat, available in either felt or straw. 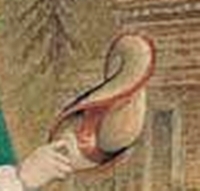 The wide-awake straw hat worn by 'Emily' in the photo. After her first season at Her Majesty's Theatre, London, Jenny Lind toured Britain, performing in operas and concerts. Construction of railways during the Railway Mania of the 1840s meant that she could travel around most of the country with comparative ease. Shopkeepers in towns anticipating a visit by the singer bought in stocks of various 'Jenny Lind' fashions and 'Jenny Lind' souvenirs. It was a little like a Royal Visit. One of her first concerts was in Birmingham and the newspaper article below is a reflection of scenes witnessed in many towns and cities in the United Kingdom. "THE JENNY LIND MANIA IN AND ABOUT BIRMINGHAM - During the afternoon she walked through the principal streets of the town, and was much amused by seeing "Jenny Lind" handkerchiefs and shirts, "Jenny Lind" snuff boxes and cigar cases, "Jenny Lind" busts, and "Jenny Lind" portraits, in numerous shop-windows in New street, High street, &c.
The crowd in the streets near the Town-hall during the performances gave to the town the appearance it wears during a music festival. As various trains leave Birmingham for the north, south, east and west about midnight, the scene on the railway station was a singular one - ladies walking or running about the platforms in full dress. Indeed, at all the stations north of Birmingham, as far as Stafford, the train at every stopping "set down" one or more parties, having all the appearance of just leaving the ballroom: and it was a novel sight at the Stafford station to see ladies elegantly but lightly attired standing on the railway platform without bonnets, and dressed for the dance, at a quarter to three o'clock in the morning. Such are some of the extensions to our modern amusements which railways afford. Ladies in full dress going thirty miles to a concert, and returning home thus attired that distance at three in the morning!" 1. Sat 28 August - Manchester - La Sonnambula. Mon 30 August - Manchester - La Sonnambula. Thu 2 September - Manchester - La Figlia del Reggimento. Mon 6 September - Liverpool - La Figlia del Reggimento. Wed 8 September - Liverpool - La Sonnambula. Jenny Lind arrived in Lancashire at the end of August 1847 for operatic performances in Manchester and Liverpool. Because of the crowds she attracted she preferred to stay at private residences, and her hosts in Manchester were Silas Schwabe & family at Rusholme. During her stay Jenny visited several factories including one of the largest locomotive works in the world, and even a phrenological gallery. She also attended a private exhibition of hypnotism given by James Braid, which was probably considered appropriate as she had recently performed in La sonnambula. JENNY LIND - MAKING THE MOST OF HER.- The following rich bit appeared as an advertisement in the Manchester Guardian of Wednesday last:-"Jenny Lind. Immense Attraction.- The bed on which Jenny Lind slept in La sonnambula, is now on view and on sale, at No.12, Peter-street.-Apply at No.12, Lloyd-street, Cooper-street. T. Pesch." 2. The Schwabe's were friends of Elizabeth Gaskell but this was before she had met Charlotte Bronte. At this point in time (August 1847) the novels written by Emily and Anne had been accepted by their publisher, Thomas Newby, and they were awaiting publication. Charlotte's novel The Professor was rejected, but she had then submitted Jane Eyre to Smith, Elder. On 8 September she travelled to Birstall to stay with her friend Ellen Nussey and on 12 September she wrote to Smith, Elder accepting their terms for publication. Jane Eyre was published October 1847; Wuthering Heights and Agnes Grey, were published in December 1847. Jenny travelled by special train to Hull, Yorkshire on Friday 10 September 1847, staying at the Royal Hotel, and gave a concert at the Royal Amphitheatre that evening. JENNY LIND'S CONCERT HULL. Mademoiselle Jenny Lind made her debut on the evening of Friday last, in the spacious building recently occupied as an amphitheatre, but now under the management of Mr Egerton. The box office at the theatre was opened for the of those desirous securing places, and on the first day upwards of £800 were taken. Similar arrangements were also made in other places, including York, Leeds, &c., and altogether the amount realised reached pretty near £1,600. Friday evening was very unfavourable for the occasion, there being an incessant fall of rain for several hours, but notwithstanding this, the number of persons assembled in Paragon-street was unprecedentedly large. The hour appointed for the commencement of the concert was eight o'clock and for some time previously the entrances to the amphitheatre were besieged by persons anxious to hear the Swedish Nightingale. The line of carriages, occupied principally by parties of distinction, extended from the Amphitheatre to Whitefriargate, and also to the end of Bond street. Indeed, the setting down of the company occupied a great length of time after the concert commenced. She may have needed them in September - advert for Jenny Lind Voice Lozenges, 1847. "Strongly recommended to all Clergymen, Singers and Public Speakers." Jenny Lind was due to leave Hull that evening on a special train laid on by the 'Railway King' George Hudson (the Lord Mayor of York), and stay as the guest of the elderly but energetic Archbishop of York. Privileges such as this were normally only extended to the highest ranks of society and royalty. A concert had been scheduled for the following day at the Festival Concert Room but unfortunately she was ill (probably a cold) and it was cancelled. There was not enough time to notify people and one report included Lord Morpeth and the Duke of Devonshire as being amongst the disappointed ticket-holders. JENNY LIND AND HER YORK ENGAGEMENT "Saturday morning came ... strangers entered the city at every avenue - and the carriages of the nobility and gentry of the county crowded the streets, and rendered the scene all animation and gaiety. Thus the affair proceeded til about ten o'clock, when the Hull telegraph announced that Jenny Lind had been unwell on Friday night, and could not then proceed to York; but that she would leave Hull at one o'clock that day, and arrive in York about three, where she would take refreshment, and then proceed to Edinburgh." 3. The crowds did catch a glimpse of Jenny at York Railway Station, which was then inside the city walls, but she only rested a short time before taking the train to Edinburgh. Another concert at Sheffield, planned for 18 September, was also cancelled. In York and Sheffield, shopkeepers were probably left with many unsold 'Jenny Lind' souvenirs. Oh, strange effect of fashion and pretence! Our good "Old Hundredth," or "God save the King"
And, wondering why he went, flies home again! To think how well JOHN BULL has proved thy GOLDEN CALF. From "Jenny Lind Fever" to "Jane Eyre Fever"
After concerts in Edinburgh, Glasgow, Perth, Norwich, Bristol, Bath & Exeter, Jenny Lind left England on Tuesday 12 October 1847. Charlotte Bronte's novel Jane Eyre was published the following week so adverts for the new Jenny Lind sheet music 'England, Home of Friend's, Farewell' coincided with adverts for the forthcoming publication of Charlotte's first novel. JENNY LIND, CLARENCE, PRINCE EDWARD, &c.
Richard Bissington, 34, Briggate, Leeds & 16, Market Place, Hull. 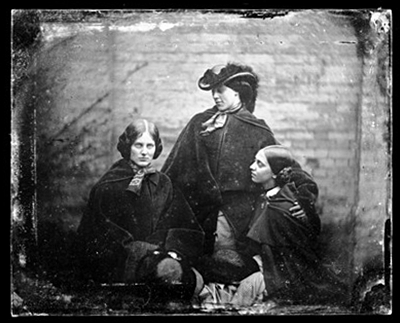 If the photo is of the Bronte sisters then it was probably taken between December 1847, after all three had become published authors, and January 1848, when Charlotte first used the word daguerreotype. JENNY LIND!! - JUST ADDED to the Splendid Collection of WAX WORK FIGURES, COSMORAMIC VIEWS, ROCK HARMONICON, &c., &c., now Exhibiting to Crowded Houses at the SALOON OF ARTS, Briggate [Leeds]. J. SPRINGTHORPE, Artist, feels grateful for the distinguished support his Exhibition continues to meet with, (being now firmly established in the Public estimation) respectfully announces that he has added to his Collection A CORRECT LIKENESS of JENNY LIND, the Swedish Nightingale. Also a Fine Figure of the KING OF PRUSSIA, habited in the Prussian uniform. 4. Charlotte and Anne travelled by railway, via Leeds, to London in July 1848. They were to meet with their respective publishers and reveal their true gender and identities. Some books state that the sisters attended an opera by Jenny Lind at the Italian Opera on the evening of 8 July 1848, but she was performing that season at Her Majesties Theatre, and not on that night. The Italian Opera Company had moved from Her Majesties Theatre to Covent Garden in 1847. As far as we know, George Smith (Charlotte's publisher) took the two sisters to see The Barber of Seville at the Italian Opera, Covent Garden. Whilst in Manchester on her second tour of Britain in 1848 Jenny Lind again stayed with her German friends, Mr & Mrs Silas Schwabe, who were now living at Crumpsall House, Middleton. On Tuesday 12 September she left Manchester for Yorkshire as she was due to give a performance of La Sonnambula in Hull on Thursday 14th. She left Manchester (12 September 1848) by train, along with another lady and four men (probably Madame Solari and Signors Gardoni, Lablache, Seymour & Royal). Instead of travelling in the direction of Hull they alighted at Halifax, walked to the nearby White Lion Inn and drove off in a horse-drawn carriage, northwards.5. This was unusual because she travelled almost everywhere in Britain by train. The destination was Bolton Abbey & Woods near Skipton, an estate belonging to the Duke of Devonshire which, over the past 30 years, had been laid out as pleasure grounds. 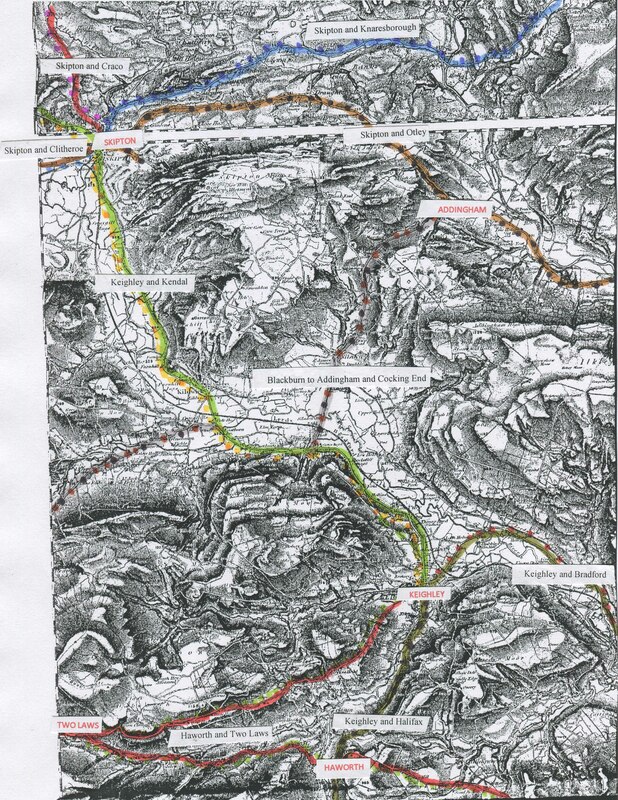 We can be fairly certain of the route taken because the best road and by far the most direct route was via Keighley, using the Halifax & Keighley Turnpike (the present A629).6. 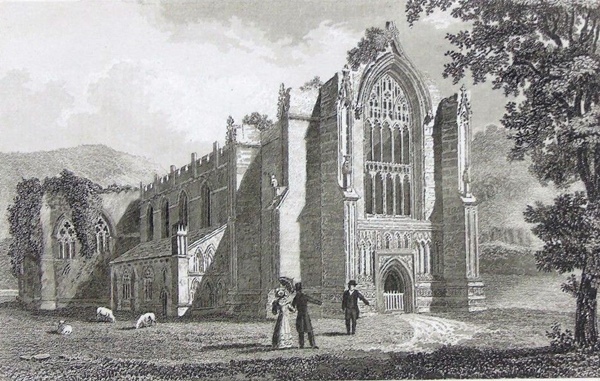 Bolton Abbey, on the Duke of Devonshire's estate near Skipton, Yorkshire c1840. Assuming that this was the route taken, then at the point where they passed the Cross Roads Inn they would have been just over a mile away from Haworth. It does seem remarkable that Jenny Lind, who in 1847-8 was perhaps the most famous and talked about woman after Queen Victoria, passed so close to three relatively isolated, anonymous women who were in fact three of the most talked about novelists of the period. At this date though (12 September 1848), it is thought that only a handful of people in Yorkshire and London knew that the Bell brothers' three novels were actually published by the three Bronte sisters living in Haworth.7. Jenny Lind and her entourage probably stayed overnight in the Bolton Bridge area because the following day (Wednesday 13 September) they headed towards Leeds where she made an unannounced visit to Marshall's Flax Mill. "...she called at the mill of Messrs. Marshall, the well-known flax spinners, at Holbeck or Hunslet, near Leeds, and was conducted over it by one of the managers. The visit was paid without any notice being given, and hence none of the heads of the firm were present. A more extensive or extraordinary specimen of a manufacturing establishment could scarcely have been chosen." 8. The reason the report describes this as an "extraordinary specimen" is because the gigantic single-storey Temple Works was one of the largest rooms and one of the most ingenious industrial buildings in 1840s Britain. It had one foot in the past and the other in the future. Built with a facade in the Egyptian style of architecture, it was also practical, with cone shaped lanterns allowing daylight for workers in the room below, on a roof with an enormous span which was turfed to keep it cool. The grass on the roof needed to be trimmed and it could sometimes be seen with a flock of sheep grazing on it; a lift, possibly using very early hydraulics, had to be used to raise the sheep up to the 'field'. Jenny Lind reached Hull on Wednesday night, staying at the Victoria Hotel and appeared at the Theatre Royal in La Sonnambula on Thursday night, "before a crowded house and most enthusiastic audience." When she left Hull on the morning of Friday 15th it was thought that she would stay at Scarborough but she "proceeded to the romantic watering place of Filey Bay". According to the York Herald she took up "residence at Foords Hotel [a coaching inn] and .... she expressed herself much delighted with the scenery of the coast and neighbourhood, and enjoyed some quiet rambles on the sands." 8.,9. "On Monday morning she went through the magnificent cathedral, and the beautiful gardens of the Yorkshire Philosophical Society, inspecting the fine collection of antiquities contained in the society's museum. Owing to the smallness of the Theatre Royal, the concert was given in the Festival Concert Room, and was attended by not fewer than 1,200 individuals, comprising members of all the noble and ancient families whose halls are scattered about the three ridings within a few miles of the city. Their enthusiasm was unbounded, and in the last part every one of Jenny Lind's songs was encored, and met with an immediate response. When she appeared for the last time, splendid bouquets were thrown upon the orchestra from 100 fair hands. Mr. Edward, florist and an extensive dahlia grower, was engaged all the day culling and arranging bouquets of his most excellent flowers, which he disposed of at large prices." 10. Towards the end of 1848 Jenny Lind appeared in concerts in various towns, raising money for good causes, and this was repeated throughout 1849 and part of 1850, the year that she left Europe for her tour of the United States with P T Barnum. For the Bronte family, the triumphs of 1847-8 turned to tragedy as tuberculosis carried off Charlotte's brother and two sisters. Branwell Bronte became ill and died on 24 September 1848. Emily Bronte was in perfectly good health but became ill with a cough a week after Branwell's funeral, she went into decline and died on 19 December 1848. Then Anne Bronte became seriously ill and, as with Branwell and Emily, became "emaciated". On 24 May 1849 she travelled with her sister Charlotte and their friend, Ellen Nussey, to York. Whilst in the city they purchased bonnets and neck ribbons and they visited York Minster.11. The following day the three travelled to Scarborough where Anne died on 28 May 1849 and the funeral was held two days later in Scarborough. 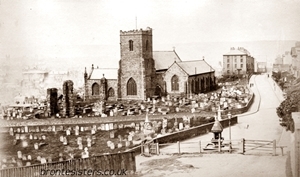 St Mary's Church, Scarborough in the 1880s. On 7 June Charlotte travelled with Ellen Nussey to Filey, staying at Cliff House, and after a spell in Bridlington they returned to Haworth. Charlotte returned to Filey in 1852 and although understandably feeling "utterly alone" she did enjoy her stay there. "If I could not be a Lind, I would not be a singer": Charlotte Bronte 12. The fame, fandom and commercialisation of Jenny Lind was a world apart from the pseudonyms and secrecy of the Bronte sisters, but they all achieved success in Britain in the same year, 1847. Charlotte admired Jenny Lind as a person. What Anne and Emily thought we may never know but they shared a greater interest in music, playing the piano together and their annotated sheet music survives to this day. Emily had the advantage of piano lessons from the best tutor in Brussels and for a few months she taught music to young pupils at the Pensionnat Heger. Her love for music and the musicality of Emily's Wuthering Heights is well documented. 13. "I do like and esteem Jenny’s character": Charlotte Bronte 14. In 1847 the wide-awake hat used by Jenny Lind in Donizetti's opera 'La figlia di Reggimento' was reproduced and sold in Britain as a 'Jenny Lind' hat, available in either felt or straw. For more information see Straw Hats and Cloaks. Classic FM: Who actually was Jenny Lind, the real-life opera singer in The Greatest Showman? (website page). Icons of Europe website - Jenny Lind (website page). Leeds, Locomotives and the Swedish Nightingale - The Jenny Lind locomotive. (website page). 3. Newcastle Guardian and Tyne Mercury - Saturday 18 September 1847. 6. 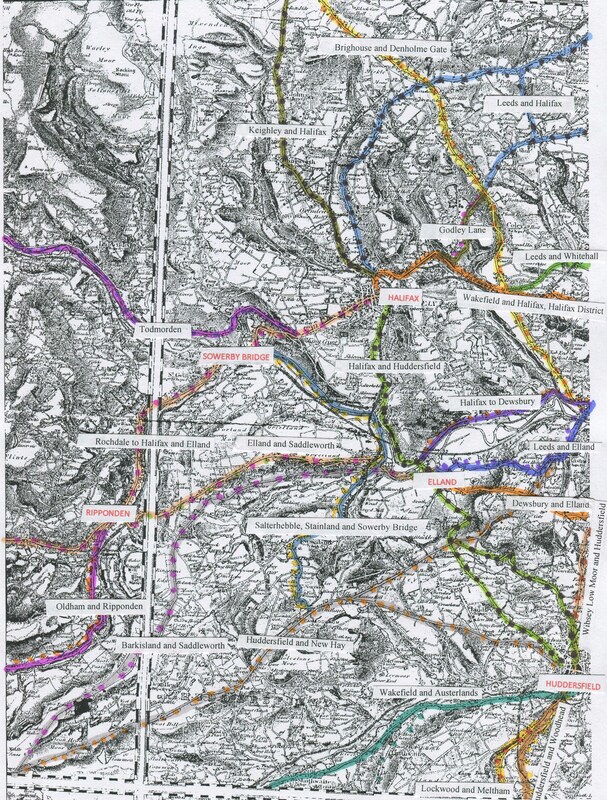 The southern section of the turnpike can be seen on this map heading north from Halifax and the northern section on this map near Keighley; Bolton Bridge & Abbey is directly north of Addingham, at the top edge of the map. The Home Page for the website is here. 7. It is not known why Jenny Lind visited Bolton Abbey. It was a beauty spot so it may have been at the suggestion of the Schwabe's, the York-born artist, William Etty, or perhaps they were there at the invitation of the Duke of Devonshire. 8. York Herald - Saturday 23 September 1848. 9. History and Topography of Yorkshire, Volume II, 1867 By Mike Thornton p.317: Whilst there she visited a farm in Hunmanby called Graffitoe House which was afterwards renamed Lind House. 11. They stayed overnight at the George Hotel in Coney Street. They were probably unaware that this was a stone’s throw away from the new home of William Etty, the York-born artist whose name appears in the Bronte juvenilia. He had spent most of his career in London, but returned to York in 1848 and was then living in a house in Coney Street. Jenny Lind sat for a portrait by him, presumably whilst in London in 1847-8. "I was told you had once some thoughts of bringing out Fanny [his daughter] as a professional singer...if I could not be a Lind I would not be a singer." 14. Letter Charlotte Bronte to W S Williams (reader at her publishers, Smith, Elder), 9 November 1850. "I received from Cornhill the other day a periodical containing a portrait of Jenny Lind—a sweet, natural, innocent peasant-girl face, curiously contrasted with an artificial fine-lady dress. I do like and esteem Jenny’s character. Yet not long since I heard her torn to pieces by the tongue of detraction—scarcely a virtue left—twenty odious defects imputed." Charlotte's novel was commenced nine months before the Swedish Nightingale's arrival in England but the similarities in character between Jane Eyre and Jenny Lind have been noted in the past. A daguerreotype photo was taken of Jenny Lind whilst in London, about August 1847, at Barratt's Coloured Photographic Portrait Institution, 222, Regent Street. The following year William Edward Kilburn took at least two photographs of Jenny Lind and at least one of Jenny Lind with Marietta Alboni. Queen Victoria purchased two of Kilburn's photos of Jenny Lind in 1848. 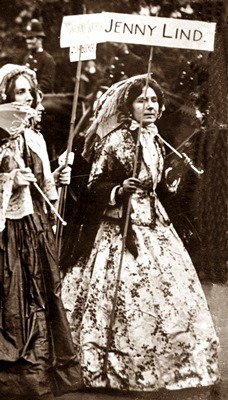 IMAGE: Possibly Jenny Lind's daughter ( Mrs. Raymond Maude) in the Suffragette Coronation Procession London, 1911.